Few love stories resemble a fairy tale as much as the courtship and marriage of Ariana Austin and Joel Makonnen. Of course, it helped that the groom is an actual prince and the bride has a prominent lineage of her own. Mr. Makonnen, known as Prince Yoel, is the 35-year-old great-grandson of Haile Selassie, the last emperor of Ethiopia. And Ms. Austin, 33, is of African-American and Guyanese descent; her maternal grandfather was a lord mayor of Georgetown, the capital of Guyana. The festivities began with a ceremony at the Debre Genet Medhane Alem Ethiopian Orthodox Tewahedo Church in Temple Hills, Md. 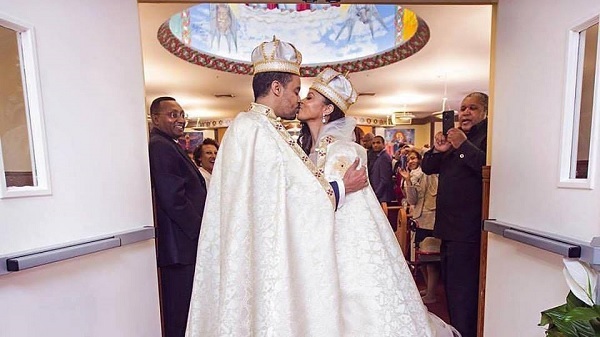 In an incense-filled sanctuary, guests in stockinged feet watched as at least 13 priests and clergymen helped officiate the Ethiopian Orthodox ceremony between Mr. Makonnen and Ms. Austin, who just days before had converted to the religion. Hours after the ceremony, the pair celebrated with a formal reception at Foxchase Manor in Manassas, Va., with 307 guests, amid gold sequins, platters of Ethiopian food and preboxed slices of Guyanese black cake for people to take home. Their marriage had been more than a decade in the making. In the nearly 12 years since they first met on a dance floor at the Washington nightclub Pearl, in December 2005, Mr. Makonnen and Ms. Austin have pursued degrees, jobs and, at times, each other. Eventually, planning a wedding just became the next item on this ambitious couple’s to-do list.